2017 University Student Award Winners Photo by Jeff Watts. Spring Commencement celebrations will begin on Friday, May 12, with the recognition of AU’s best and brightest undergraduate and graduate students. 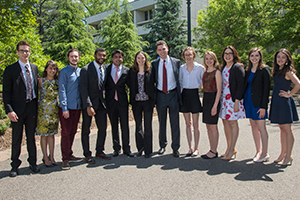 The University Student Awards are presented to students for exceptional academic achievements and enhancing the AU community through their leadership and service. Graduate students Anila D’Mello and Martha Falkenstein will both accept the prestigious Outstanding Scholarship at Graduate Level Award. Falkenstein has published 18 publications and 25 individual presentations. Her research on how to improve treatment for trichotillomania – compulsive hair-pulling – helped her earn this award. “It is my hope that the research I did during graduate school has made a meaningful contribution to improving treatments and reducing relapse rates among individuals with the disorder,” Falkenstein said. D’Mello’s research in neuroscience led to her authoring seven peer-reviewed articles while at AU. Her research and writing is so highly regarded in the field of neuroscience that she presented at seven different conferences such as the Society for Neuroscience Annual Meeting and the International Meeting for Autism Research. Undergraduate students Casey Chiappetta and William Kakenmaster both will receive the Outstanding Scholarship at the Undergraduate Level Award. Kakenmaster’s research has been published in the University of Southern California’s undergraduate journal Ilios, AU's undergraduate journal Clocks and Clouds (where he also served as editor-in-chief), and the Oxford Council on Good Governance's paper series Global Migration. Kakenmaster also helped create AU’s first undergraduate policy journal The World Mind. “The twin values of knowledge and learning stand tall as a sign of AU's resolute commitment to informed, reasoned, and intelligent scholarship,” Kakenmaster said. Chiappetta will receive the Outstanding Scholarship Award based on her work as a writer, editor, and organizer. As a writer, Chiappetta has 12 published articles in the American Way of Life (AWOL) magazine and BleakHouse Review. She also served as the editor-in-chief for AWOL. She leveraged her writing to organize a workshop titled “Race and Journalism.” Chiappetta is currently organizing a media literacy workshop for students at Wilson High School regarding the impact of fake news. Along with academic honors, AU will recognize two students who have most made the most impactful and unique contributions to the university community with the Outstanding Service to the University Community Awards. Thomas Florczak is one of the recipients. As president of the Interfraternity Council, Florczak was a valued voice in the Sexual Assault Working Group (SAWG), to ensure that AU fraternities are part of the process in preventing sexual violence. Florczak also used his relationships in SAWG to create Title IX trainings for the AU fraternity community. “I hope that fraternities continue their reflection and refinement of practices to create a better environment for the whole campus, not just on issues of sexual misconduct. Fraternity members have often led in a variety of fields throughout history, and I hope that fraternities continue to do so on this campus,” Florczak said. Valeria Ojeda-Avitia will also receive the Outstanding Service Award. As Director of the Kennedy Political Union, Ojeda-Avitia brought in a diverse array speakers like rapper Common, former Secretary of State Madeleine Albright, Anita Hill, and Black Lives Matter co-founder Patrisse Cullors. Ojeda-Avitia’s most impactful contribution may have been as campaign manager of Student Government’s TurboVote campaign. TuboVote registered 1,000 AU students to vote during the 2016 elections. “I personally was very passionate about TurboVote because I am a daughter of immigrants. I'm really glad that our team registered so many students because we made it that much easier for peers to be civically engaged,” Ojeda-Avitia said. AU also will honor 11 students who have made significant contributions to AU and the greater D.C. community through their leadership, community-building, mentorship, and cross-cultural exchange. Harold Johnson Award recipient Asha Smith helped re-establish the campus’ NAACP chapter, and through creating “Sister Circle,” a mentorship program where AU students mentor students at Luke C. Moore High School. “Programs like Sister Circle are incredibly important because they further spread AU's influence into the D.C. community. We were working with students who either didn't know AU existed or that there were scholarships available to them to pursue higher education. My hope is that Sister Circle made a difference for the women at Luke C. Moore High School and AU,” Smith said. “I felt that it was important to have the Asian American Student Union collaborate with other groups, especially with other Asian organizations, because they all share the same desire – the desire to create a home for everyone studying at American University,” Aung said. Emily Dalgo will receive the Fletcher Scholar Award for her academic research, socially conscious creative writing, and her commitment to food security on campus. Dalgo drafted a proposal to create a food pantry at AU, which is currently being developed. “AU isn't immune to classist stigmas of poverty and hunger that cause silence around these issues, so I wanted to take action to try to change the conversation and help students who have struggled with food insecurity feel heard and understood,” Dalgo said. Bruce Hughes Award recipient Monica Emma made it her goal to steer students toward a more sustainable campus. Emma co-founded the Zero Waste Club, which teaches AU students about contamination and waste on campus through student-led events on campus. Through that work, Emma helped start Project Move In/Out, which encouraged students to donate or sell-back unwanted clothing and furniture at the end of the school year. Emma's commitment to sustainability impacted the D.C. community, as she lead an AU team to victory in the "Power to Save Energy" competition. “To have this work noticed by the university through the Bruce Hughes Award, an award that recognizes the leadership and service of students in memory of a man who himself lived these values, is an amazing honor,” Emma said. Business Administration major Danyal Sheikh, who mentored fellow international students and re-established the AU Entrepreneur’s Club, will receive the Charles C. Glover Award. “The Charles C. Glover award represents my values, personality, confidence and passions. The award shows me and my peers that your only limit is you,” Sheikh said. Mike Romadka and Ron Jordan both will collect the Evelyn Swarthout Hayes Award for their work in advancing the arts at AU— both through very different paths. Romadka’s has used his audio engineering skills to support the work of artists throughout campus and is also an accomplished drummer who was the featured student performer at the INTERFERENCE: new music collective. “The technical and aesthetic achievements made by everyone involved are incredible, and to perform alongside such a high caliber of musicians and technicians was truly an honor,” Romadka said. Jordan’s achievements included being vice president of Men of Empowerment and Excellence and a peer consultant at the Kogod Career Center for Development where he mentored incoming Kogod students. Jordan’s major contribution to the arts at AU was creating Second District Records, a student-run record label. “For me, the call that I won the award made me stop for a minute and appreciate my journey, the challenges that came with it, and the successes and failures that helped me grow,” Jordan said. Megan Madeira will receive the Kinsman-Hurst Award for her leadership of different organizations on campus. As president of the School of International Service Undergraduate Council, she created the Students Outreach and Aid for Refugees committee to work with refugees in the D.C. area. Madeira also organized and co-led a successful three-week Alternative Break to Rwanda with 10 undergraduate and graduate students to learn about women and youth development in a post-conflict environment. Dual Political Science and Communications Studies major Sasha Gilthorpe made an indelible mark on the AU community as Student Government (SG) president, which led to her winning the Catheryn Seckler-Hudson Award. As SG president, she saw a need for more attention to mental health and established the Executive Director of Mental Health position. Her most impactful moment came when she commissioned and released the SG report titled “The State of Diversity and Inclusion.” Proposals from the report were reflected in President Kerwin’s long-term plan for making AU a more diverse and inclusive campus. “Working on such a variety of issues meant that every student, or nearly every student, will benefit from some of the changes we made together,” Gilthorpe said. AU varsity swim teammates Shannon Scovel and Caylee Watson will pick up awards for contributions to the AU community inside and outside of the pool. Scovel earned the Charles W. Van Way Award for dedication to community as member of the swim team and through her work as editor-in-chief for The Eagle. “The balance was hard, but every time someone produced an exceptional piece of reporting or spent months working on a story that made it into the print edition, I felt an enormous sense of pride,” Scovel said. Scovel will also be honored as the recipient of the 2017 President’s Award. Watson, the Stafford H. Cassell Award recipient, not only served AU as a record breaking swimmer on the swim team, but also represented AU and the U.S. Virgin Islands internationally at the 2016 Summer Olympics in Rio. Watson did all of this while maintaining a near perfect GPA and supporting her peers and classmates. “AU gave me the confidence and strength to reach all of my goals, and I couldn't be more grateful and appreciative for that,” Watson said. These students have all left a major imprint on AU. Each student, in their own way, helped to serve and change the AU and D.C. communities for the better.